Your daily Tarot card for tomorrow Tuesday, April 23rd 2019 is King of Swords. A clever and resourceful man will give you some good advice or a hint tomorrow. In your partnership tomorrow an intelligent and self-confident man will become important for you. If you are a woman, then this Tarot card shows your own husband. You respect and love him and you greatly appreciate about him is that he is clever and good at business. 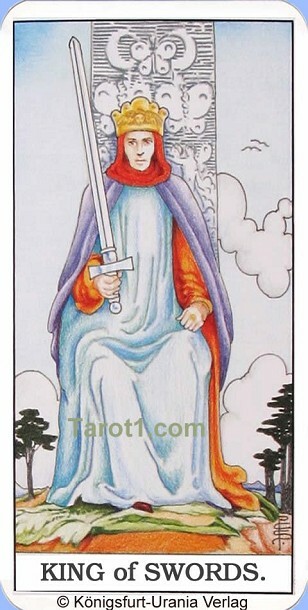 In this Tarot card the proud king of Swords sits in his throne and holds the sword of justice in his right hand. This is meaning that a wise and sagacious man who is very eloquent will help you.